On my way back from the season's last roadtrip to Death Valley, I stopped in the Kern River Valley to tag a few easy summits in the morning before heading home. The first of these was somewhat of a bust from a goal-oriented perspective, but that's the way it goes sometimes. Located on the far eastern end of the valley, Peak 5,354ft lies at the foot of Spanish Needle, overlooking the junction of Canebrake Creek and Cow Canyon. The crux was the initial crossing of Canebrake Creek, not because of high water but rather the dense brush that lines the banks of the creek. Teetering from branch to branch across the shallow stream was an exercise in agility, not something one has in spades at 56yrs of age. Once across the creek, there is an easy hike up a gentle grade through light brush to the base of the mountain. Then things get steep, climbing 1,200ft in less than half a mile, and if there was any cold left in me from the morning, it was long gone. I found a survey post atop the summit, or what I thought was the summit, but turned out to be Pt. 5,340ft. The true summit was still 1/5mi to the northeast, but I didn't notice it through the scraggly trees that partially blocked the views. Doh. To add insult, I had the correct point on my GPSr, which I've taken to carrying on every hike to avoid such miscalculations. It seems you have to actually look at it for it to be of any use. I think I need my GPSr dumbed-down like Google Maps. This summit overlooks the community of Squirrel Mountain Valley on the south side of Lake Isabella and SR178. Paved roads in the area allow one to drive to 3,200ft, making the climb less than a mile roundtrip. Still, one climbs more than 800ft in the process, another steep effort. The summit and much of the mountain is BLM lands, but along the road there are various private holdings. I parked at a small turnout and headed up to one side of a home, no fences or No Trespassing signs. A major fire that swept through the area the previous summer has left much of the landscape bare, including the route I used from the west side. Most of the trees were burned but the open slopes and bountiful rains have left tall grass and wildflowers, taking the edge off the fire scars and promoting recovery. 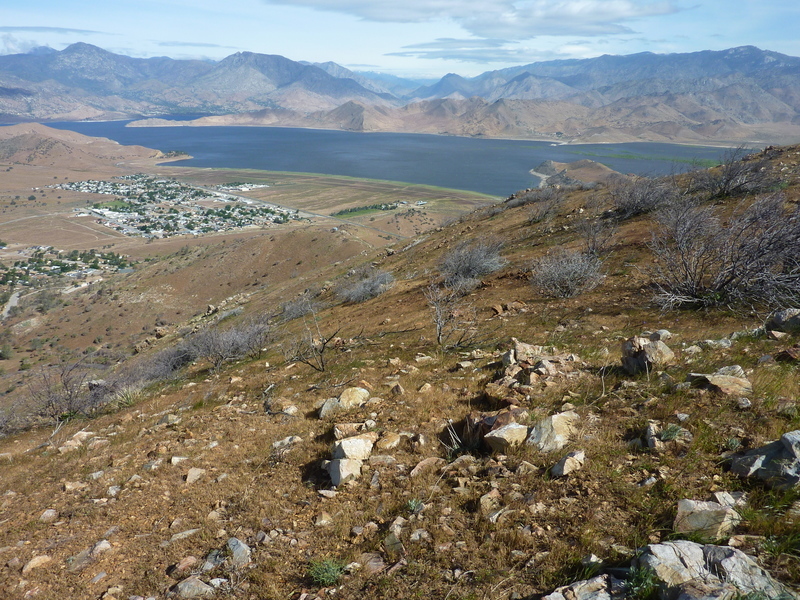 The open summit atop a small rock outcrop offers fine views of Lake Isabella and Squirrel Mountain Valley. A busy summit register labels it "Cooper Peak". Deb and Doug Cooper seem to be the most frequent visitors judging by the entries. They recently got a new dog which they named "Cooper". Seems they like to name things after themselves. This unnamed summit lies south of Squirrel Mountain Valley and the ridge extending in that direction from the slightly higher Cook Peak. Both are part of the Piute Mountains, a small subrange of the Southern Sierra. I first tried to start from the end of McCray Rd, but found a No Trespassing sign there next to a house at the end of the block. Though the summit itself is on BLM lands, the approaches appear to be ranch lands to the northeast. I decided to move the car and start up from the end of Fawn Dr which does not have a similar sign and one could actually drive on the dirt road heading south without running into a locked gate. Even hiking from the pavement, the hike is only about 3mi roundtrip. I walked past a water tank before turning right, crossing a barbed-wire fence and starting up a likely-looking ridgeline. Another fence runs partly up this ridge before veering to the right. Thanks to the fires, the slopes are mostly open grasslands with few trees and make for easy cross-country. About 1/3 of the way up the ridge I crossed an old dirt road where an old concrete foundation is found, marked "Ruins" on the topo map. No clue as to what this once was. Once on the main crest the steep slope relents and makes for an easy walk for the last five minutes. It took me an hour to climb the 2,000ft+ to the open summit. I enjoyed the views in all directions ( south to the higher reaches of the Piute Mtns, north to Lake Isabella and Squirrel Mountain Valley/Mountain Mesa, west to the Kern River Canyon heading west to Bakersfield and the Central Valley). On the way down I passed by a large field of yellow flowers that can be seen brightly coloring the slope from SR178. There are other flowers in purple, orange and other flavors as well, all a bonus after the fire. I descended a different ridge on the way down, the next one to the south which proved just as good as the ascent one. Back before noon, I had about 5hrs of driving to get back to San Jose where I'd arrive in time for dinner. Nice! I've driven the van on the long dirt road up to Cook Peak, so one could more easily access Peak 5,253ft by driving up this road to the saddle. From there it's less than 3/4mi to the summit with only about 400ft of gain.